You may purchase anything on our online store and we will have it ready for you for your next float! Give the gift of floating by registering the gift recipient on the Book Today tab. To avoid ruining the surprise, use either your e-mail or a fake e-mail and we will adjust when they come in for their float. On the 'Pricing' sub-tab, purchase your gift (Introductory Float, Monthly Memberships, and Bundle Packages are available). Note that if you select a Monthly Membership, your card will be charged again at the start of the next monthly billing period. 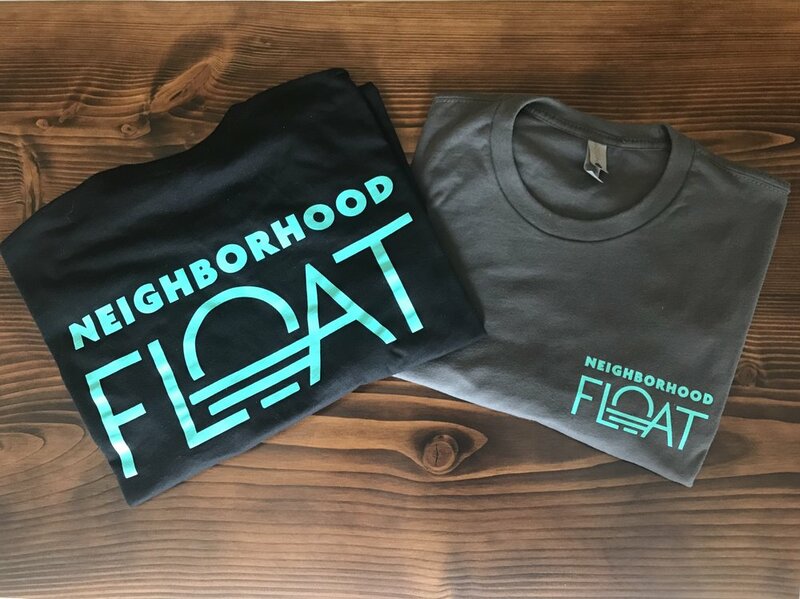 E-mail info@neighborhoodfloat.com before the next billing date to cancel or change between monthly memberships on any month. No fees here! Take advantage of our 'Book A Buddy' feature that allows family and friends to split monthly memberships or bundle packages to access cheaper floats. Once purchased, the account will now have credit(s) to book their next float on the ‘Floats’ subtab. Heavy Metal (Dark Gray) and Black T-Shirts are available in any size for $15. Like the toiletries we offer? Take them home with you. Available in 8 oz. for $8 and 16 oz. for $15.